One of the advantages of modern technology is that it allows virtually everyone to tap into their creative side. In the past, creating a work of visual art would have required not only artistic skill and experience but also the need to purchase specialist equipment and materials. Digital photography, on the other hand, allows absolutely anyone to capture stunning images on a wide range of devices, and the technology offered by bonusprint means that everybody can create photo collages easily with great results. It’s possible to turn your favourite images into books, albums, mugs and even cushions, but one option which appeals to huge numbers of people is to take a favourite image and have it displayed on the wall of their home. This is even more fun when you collect several photos and make a collage of them. 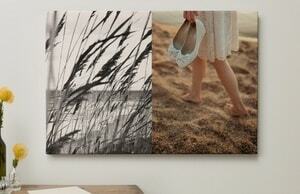 You can make your own photo collage on canvas prints, acrylic prints, aluminium prints and mounted prints. The wall art which we create are of the same kind of quality as those which you’d purchase from a high street shop or gallery, with the unique selling point being that the image you use is yours and yours alone. 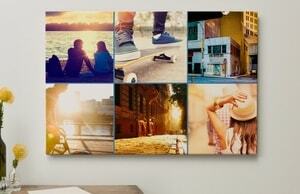 You don’t have to be an artist to create a beautiful photo collage on a wall art. 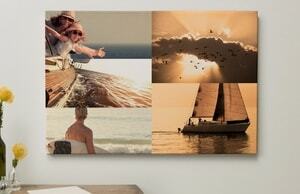 With our easy to use online editor you can bundle those photos and create your own wall art. You can create space in between the photos by adjusting the spacing. You decide how big the inches of the spacing will be and you can even choose a background to fill up the empty spaces. Taking photos is a perfect way to immortalise our happy moments. Creating a photo collage is a fun creative way to relive and then display our photo collections. From time spent with family or friends; at home or on holiday; photo collages capture multiple moments and portray them together in one image. Collage photo prints look fantastic displayed at home or in the work place. They make excellent gifts for loved ones- nothing says thoughtful like a collection of photos affectionally arranged together. 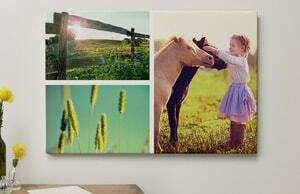 With a wall art photo collage you can choose up to 15 photos. When you visit our site to create a wall art photo collage, the first thing you’ll note is that the software you’re using has been designed with the beginner in mind. Whether you’re accessing via a computer, smartphone or tablet (also check out our apps), you’ll be working with technology which guides you through the process one simple step at a time, from choosing the size and shape of your canvas to selecting exactly where to lay out each of the images you’re using. There is no time limit on how long it takes you to create your collage. bonusprint offline creator tool gives you the opportunity to save directly to your computer. Saving to your computer means you also have an instant digital copy of your photo collage. The online creation tool gives the possibility to create your collage quickly. First, just select your favourite pictures from your computer. Second, upload your photos. When your photos are uploaded it is all for you to arrange them in a creative manner that pops for you. bonusprint is also available in app form- you can create your photo collage on the go. By using bonusprint app you are can upload photos direct from your smartphone. The options on offer when creating your photo collage includes the size and layout of the finished product – whether that’s square, landscape or portrait – and even the material upon which it is printed, canvas, acrylic, aluminium and mounted prints. You can choose up to 15 photos with different layouts, spacing in between the photos and background colours. No matter what options you go for, our state of the art printing processes will ensure that every details of each individual image is sharp, crystal clear and well defined. A collage of this kind won’t simply be a fantastic addition to any family home, it could also make a fantastic gift. Just imagine the delight of a grandparent receiving a collage based around the grandchildren they dote upon. No matter why you create your collage prints, or which images you choose to include, the finished item will be a family keepsake and a stunning work of art all at the same time. Ordering your photo collage from bonusprint is a simple and straightforward affair. Once you have created your collage using either the offline or online creation tool, you can select from numerous different formats. bonusprint offers many choices including calenders and hand made canvas’. bonusprint strives to produce all images to the highest quality. bonusprint accepts all standard payment methods including PayPal and AMEX.